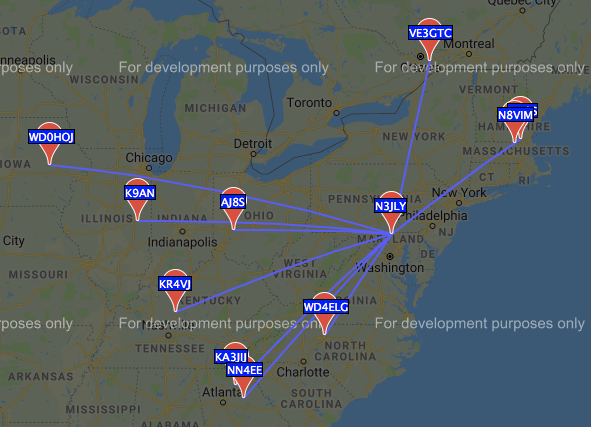 I've finally gotten around to playing with WSPR. i've been transmitting on the 40m frequency for a few minutes now, looking at reports of my transmissions. This looks very reasonable for NVIS reception. I am transmitting 5 watts. Of course WSPR is an excellent low signal level mode, so it would not be likely that a USB or AM transmission would be heard over this entire area, but the general range is as expected. 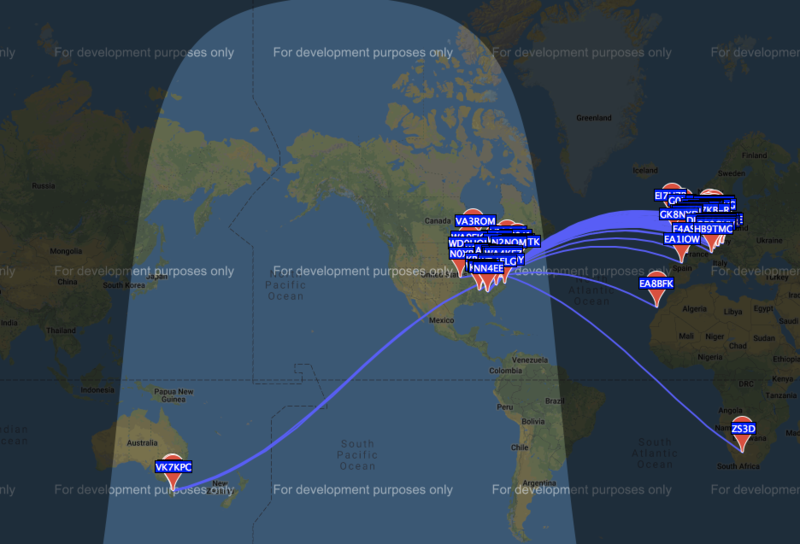 Quick summary of WSPR: Stations transmit during two minute slots, skipping now and then, and each station is [usually] on a slightly different frequency. Receiving stations decode transmissions and find as many as they can, and send this data to a website, where it is plotted. In addition to transmitting, you can look at the map and list of reports to see who is being heard where. As always, you are somewhat limited by how many stations are actually listening, and where they are located. It's a great way to observe real time propagation on the various ham bands. And now at 2130z even better range, reaching into Europe which is expected, since Europirates are audible now. Australia seems quite likely, since the weather station on 6230 USB is audible this time of the evening. The report database contains SNR information for each report. This could be useful for estimating and tracking propagation conditions. To what do you attribute the report of being heard by the daytime path in Australia? If that's accurate and VK7KPC really copied you, it would seem to me that long path was more likely. I suspect it was actually a greyline condition. Yes, that would have been long-path for sure. When (or is that if?) my KiwiSDR arrives, I will may set it up to check WSPR channels and upload spots.